Sofa beds have changed a lot over the years. What was once a piece of furniture for the spare room has now become suitable for even the most stylish of living rooms. There are plenty of different types available. Corner sofa beds with storage are among the most popular. Choosing your sofa, however, can be quite a difficult task. With this in mind, please read the tips below to help you decide on the right model for you. Choosing your Material – This is one of the first things that you should think about. If you have pets or young children, then you will probably want to go for leather as it is easy to clean. If, however, you want something that matches the decor of your home nicely, then you might want to choose fabric. Have a think about the long term before you choose the fabric of your corner sofa bed with storage. Reclining or Not – Some of the more expensive corner sofas with storage will have certain parts of the sofa that are able to recline. Reclining chairs are very comfortable and particularly useful if you suffer with a bad back. When choosing your sofa, have a think about whether or not you want your sofa to have reclining chairs. The Amount of Storage – When choosing your corner sofa with storage, it is important to consider just how much storage you are going to need. If you have a large living room, for example, and you want to be able to store a lot of things, then you are going to need more drawers or storage space. However, if you have a smaller living room then you can still benefit from a smaller model with less storage. These are just a couple of the factors that you should consider before buying your sofa. In order to make your life easier, we decided to take a closer look at some of the best corner sofa beds with storage on the market right now. Please read on below for our thorough reviews. Very comfortable fold out double bed. The sofa is quite big. Made from high-quality polyester, the Home & Haus Aysen Corner Sofa Bed is as elegant as they come. 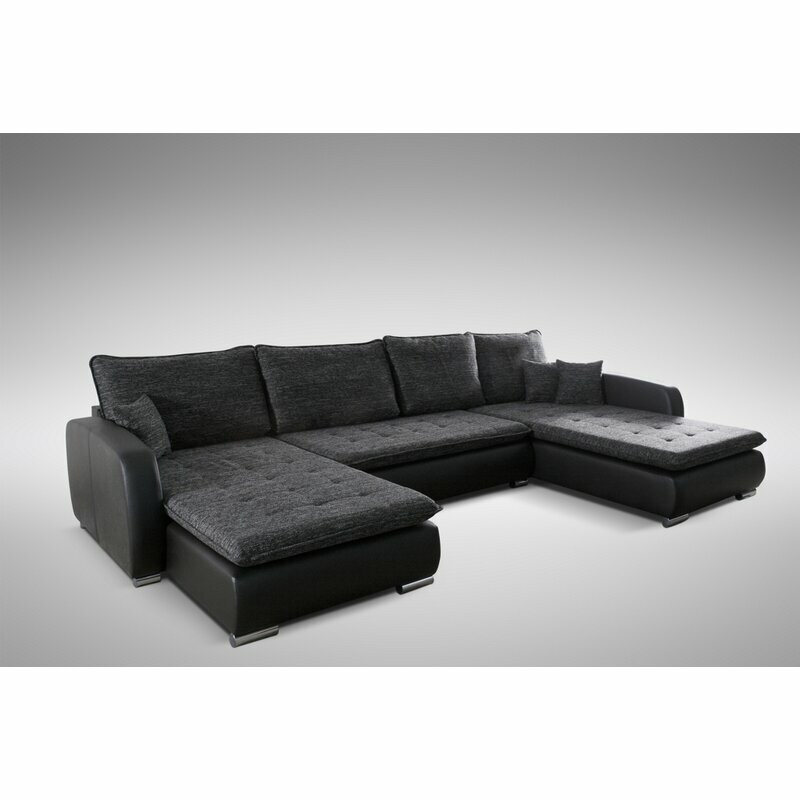 In a lovely charcoal colour, this corner sofa looks beautifully modern. There are plenty of things that we absolutely loved about this sofa. First of all, the contrast of the fabric is lovely. The frame of the sofa itself imitation leather and the seats are polyester. The quality of the stitching on the seating part of the sofa is fantastic and the material feels very nice indeed. The imitation leather is incredibly high quality and feels very durable and not susceptible to scuffs and scratches. To complete the modern look, the legs of the sofa are in chrome. This is an incredibly well made corner sofa and the quality of the materials is very high. In terms of comfort, we found the sofa very comfortable indeed. The cushions themselves are high quality polyester and feel firm and supportive; they are very nice to relax into. The double fold out bed utilises the storage space of the sofa as bedding. Again, we found the bed very comfortable too. In terms of storage space, there is plenty of it with the Aysen; more than enough to store everything that you could possibly need to in your living room. We stored some bedding in the drawers and had no problem with a lack of space. Overall, this is a beautiful, elegant sofa that would look fantastic in any modern living room. This is why we have chosen the Aysen from Home & House as our number one today. Very comfortable seats and bed. Plenty of under seat storage. Neutral colour which is suitable for most decors. Not really suitable for homes with pets or children. The chrome legs would look better in wood. Yet another model from the Aysen range, this one caught our eye because of it’s simple yet elegant design. In a neutral beige colour, we feel that this would be the perfect choice for both the modern and traditional living room. It is a diverse sofa that is packed with hidden storage and a lovely design. This Aysen model is made from a very high-quality polyester blend. The quality is instantly recognisable by the fine stitching and soft touch. There is one thing that we did notice with this one – if you have young children or pets in the home then it probably won’t be the best choice because it could be quite difficult to clean. The seats of the sofa are filled with polyurethane foam which is incredibly comfortable to sit on and lay on. Much like the previous model, this sofa has a fold out double bed space which makes use of the under seat storage for a sleeping area. We have to say that sleeping on the bed itself was a very pleasant experience. When it comes to storage, there is plenty of it with this sofa. The drawers underneath the seats are plenty big enough to store all kinds of things and the space is easily accessible without having to put in too much effort to get to it. Putting the sofa back together was very easy too. Overall, we were very impressed with this right hand corner sofa bed. It is comfortable, well-designed and looks fantastic. Reversible design – it can be left or right hand. Instructions are a little difficult to understand. Not as comfortable as the previous two models. The last corner sofa bed with storage to made our list is the Gianni Reversible Sleeper Corner Sofa Bed by Bel Etage. This one is just as elegant as the previous two, but it is a little different. With this one, you can either have it as left or right hand. This is great, because it makes it suitable for most living rooms. The material that the seating is made out of is a lovely jumbo cord material. This feels very nice and looks fantastic too in both a modern and traditional setting. The seats themselves are fairly comfortable, but we did find that they are not anywhere near as comfortable as the two previous models that we reviewed which are more expensive. Using the bed is very easy; you simply have to pull it out. Again, the bed is plenty comfortable enough, but not as comfortable as the previous two that we tried. Considering this is far more affordable, this is to be expected. There is still plenty of storage space available, fortunately. The one issue that we had with this sofa was putting it together. This is not a reflection on the design of the sofa. The design is fine, it is the instructions that are very hard to decipher. Fortunately, you can get them online and there is plenty of help available. For a fairly mid-range corner sofa, this is a great choice, especially if you have a tight budget to work with. Hopefully now you have a much better idea on the best corner sofa bed with storage for you.